As a counterpoint to our summer solstice 400k to Weston-super-Mare, cycling buddy Dave and I had been planning a ride for the winter solstice (ice permitting). Due to Christmas party commitments, I had to talk him down from a Woking- Cambridge – Oxford 400k loop, then we finally gave up on doing anything much more than a 100k. 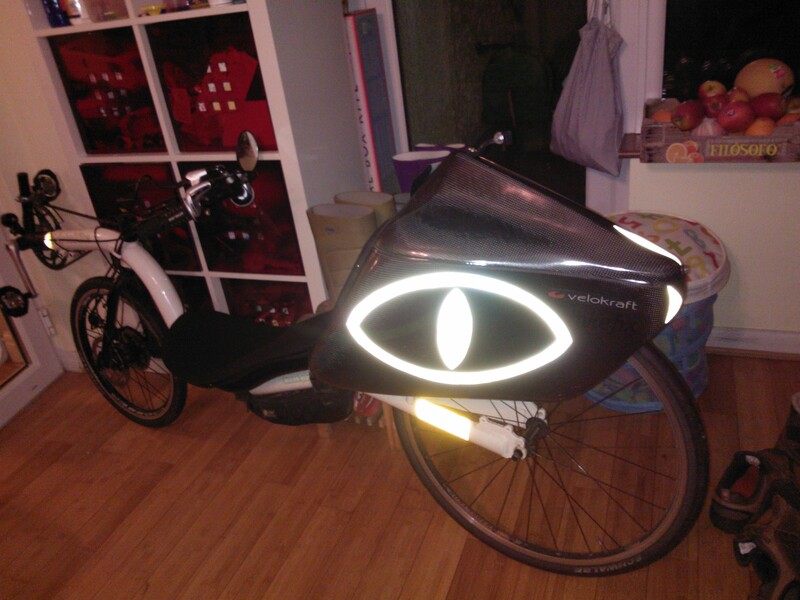 I had decided that to do something different, I would take the recumbent on the ride. Knowing this, I planned a flat as possible A-road route to Winchester taking in some big roads because of the early start time. This seemed to do the trick and we had no hassle from bad driving. In fact, one car refused to come close to me from Fleet to Aldershot, so ended up going 15mph for about 3 miles! Dave tells me that from behind it looks rather like a snake, so success. 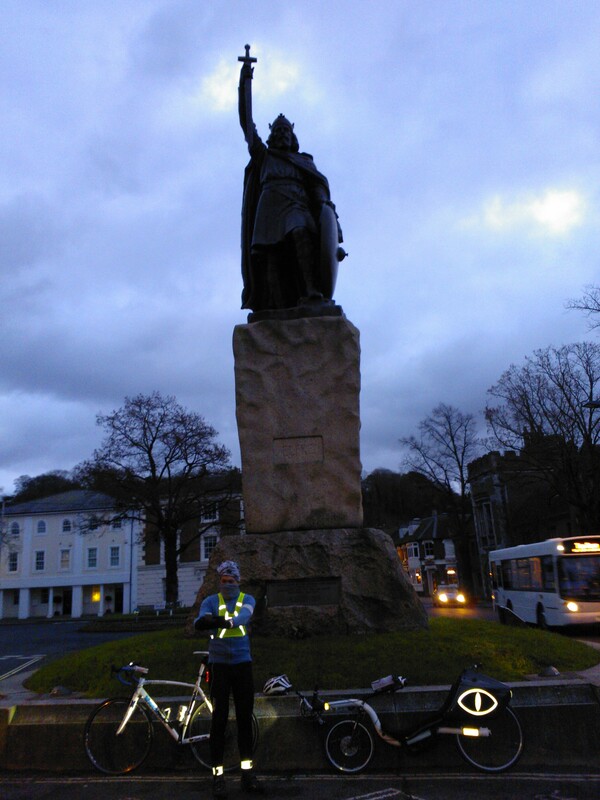 Our ride to visit King Alfred in Winchester was a success. However, we suffered several mechanicals en-route. First, my chain un-shipped a couple of miles from home over bumps requiring a quick stop. Then a rubber band on my GPS holder failed. Thank goodness it didn’t fall off completely as we were on a quick descent along the A31 at the time. I thought to give up with the GPS at the time. but then stashed it in my bag. This is why the track is in two parts. On the descent into Winchester (about 1km from where the photo was taken), Dave suffered a front puncture, then just before the turn for Axford along the A33, Dave’s chain also un-shipped! Upon arriving home, I was rather disappointed about our finishing time (about 4 hours 45 minutes, where a good 100k will take 4 hours) but the average moving speeds aren’t too shabby, so I think the many small stops hurt our time. Probably jumping straight into 100k with no preparation on the bent was a mistake, because my legs didn’t recognize what I was forcing them to do and I’ve been un-able to bend my knees for a couple of days. I also had the feeling that rough roads (washboard rather than potholed) really slowed me down. When I was on a smooth piece, I’m sure I could make 10kmh more for the same effort! I feel this somewhat on the upright and not having done that route before I have no direct comparison, but it could well be the difference between the 700c and 20″ front wheels. Maybe it’s time to get myself kitted out with a 26″ front.